Quiet weather across Colorado for a while! DENVER -- The weather pattern will be very peaceful for the next few days for Colorado and the central Rockies. Along with the dry weather, it will become very mild for mid-December. 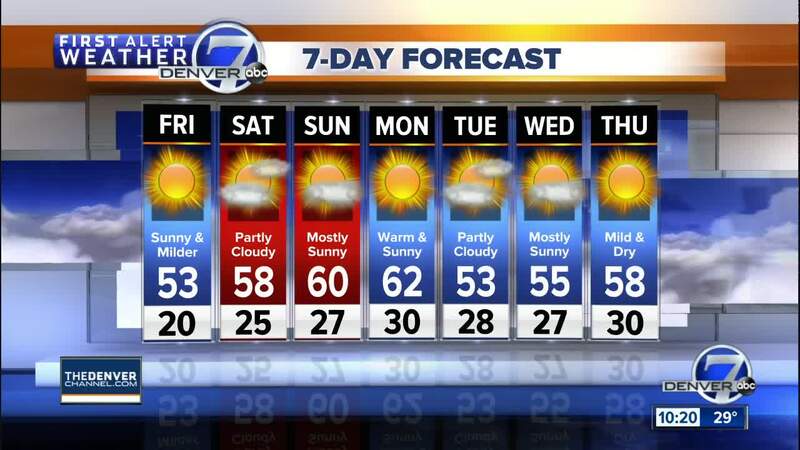 Temperatures will reach the low to mid-50s in Denver today and be in the upper 50s to low 60s Saturday through Monday. In the mountains, ski conditions are very good, but there will not be any new powder for several days. Nighttime lows will be in the single digits and low teens, with daytime highs in the 30s. Not exactly what we would typically expect for the days leading up to Christmas, but even without snowflakes falling, it is still rather Merry and Bright! By the way, next Tuesday and Wednesday, Denver7 will provide our FREE HOLIDAY HOTLINE! We will have meteorologists LIVE in house to provide custom travel forecasts for anywhere as you plan your trip "over the river and through the woods"!